Inspired by my fellow B&B landladies at Hopton House and The Old Stables, I decided to try making my own granola. Inspiration aside, I was struggling to get the quantity and quality we wanted for our B&B guests from any of our usual shopping destinations. Through the power of social media, I stumbled across a recipe in (of all places) the 'Go Outdoors Camping Cookbook' and when I realised who the recipe's author was, I knew it was the one for me. It comes from one of my favourite walking writers, a guy called Keith Foskett (nicknamed 'Fozzie', hence the blog title). He's a hard-core long distance walker and I've read his books about walking the Camino Santiago in Northern Spain and also the Pacific Crest Trail in America, which is 2,850 miles long. 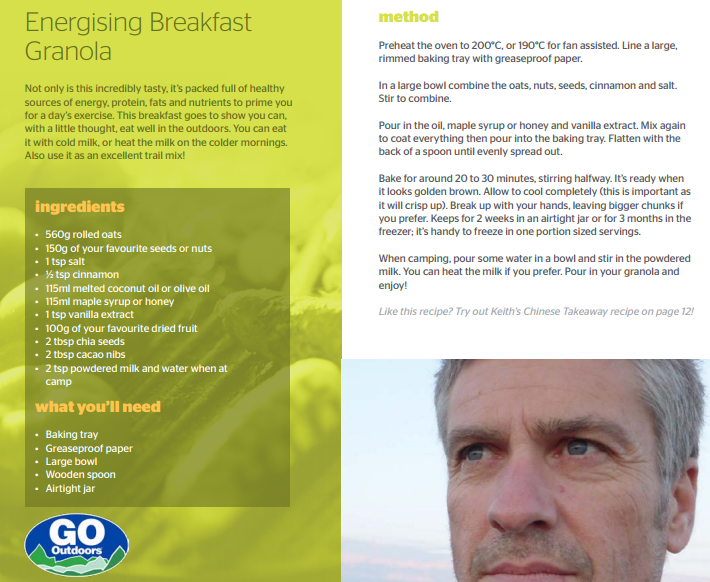 Keith makes this granola up and then adds powdered milk and water on the trail, so it's an instant breakfast. I've adapted Fozzie's version, partly due to availability of ingredients - I use seeds instead of nuts and use olive oil so that it's a nut-free option, but you can tweak it to your own taste. I've been asked for the recipe a few times now so it seems to be going down well and I do enjoy it myself, especially with a blob of greek yoghurt. According to some of our recent guests, it's guaranteed to set you up for a good walk or a spot of downhill mountain biking in the Shropshire Hills!